Glitter is tiny flecks of colored and reflective plastic used in the nail industry for its lustrous and luminescent effect on nails. It varies in shape, color, and size and is applied to nails using glue and top coat or embedded in gels and acrylics. A Little History: According to popular lore, glitter as we know it today owes its existence to Henry Ruschmann, a machinist in Bernardsville, N.J., who in 1934 invented an efficient way to grind up plastics into abundant amounts of glitter. He started a company in the same year called Meadowbrook Inventions, which is still in business today as one of the world leaders in glitter production. How It’s Made: Sheets of plastic film of varying colors and thickness are fed into machines with whirling cutting blades that can be calibrated down to the micron. 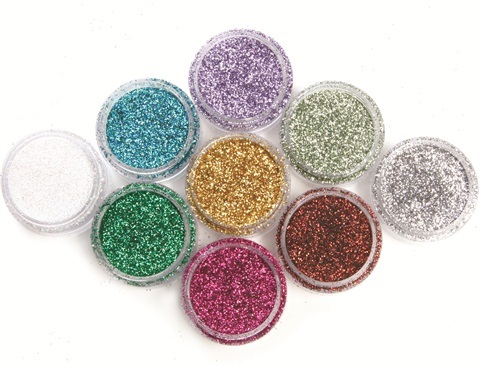 A client will request a certain size cut and a certain shape (most often hexagonal) and the glitter manufacturer will collect the chopped glitter and deliver it to the client for packaging. Why the Shine: The tiny flecks have the uncanny ability to reflect light as it shines off the many surfaces of each finely cut speck. Often during manufacturing, a sample will be taken and placed under the microscope to ensure the consistency of the cut and the accuracy of the shape for maximum light reflection. The rolls are typically plastics from the polyester family, and include polyethylene terephthalate, polymethyl methacrylate, and polyethylene naphtalate, to name a few. Check out the “glitter” entry on NAILS Encylopedia, www.nailsmag.com/encyclopedia, for more articles on everything you’d want to know about glitter.